On Saturday, July 29, 2017 we attended the 3rd Annual Fair Trade Fashion Show at CTRLCollective in Downtown Los Angeles. This year's Fair Trade Fashion Show was hosted by ethical boutique Bead & Reel to benefit Free the Slaves, an international nonprofit dedicated to liberating slaves and changing the conditions that allow modern day slavery to persist. This sold out event raised over $31,000 for Free the Slaves to help with their holistic anti-trafficking projects in six countries: Haiti, Ghana, DRC, Senegal, Nepal, and India. The rustic chic venue had an open two-story layout. The runway presentation was set up on the lower level and an open market bursting of ethical brands on the top level. The vendors included: Maggie’s Organics, GlobeIn, Gaffer & Child, Lucy & Jo, Malia Designs, International Sanctuary, Ten Thousand Villages, Heshima Kenya, Hfs Collective, Kishe, rHope, Elisha C.
The amazing food and beverage sponsors were Au Lac, Rachel’s Cosmic Cuisine, Baby Love Sweetery, FAIR Drinks, Sprouted Chick, 300lb Vegan, Plant Alchemy, Harmless Harvest Coconut Water, Boxed Water and Alta Palla. Before getting to the runway show, there was an enlightening panel discussion moderated by Kestrel Jenkins - Founder and Producer of Conscious Chatter. Her podcast Conscious Chatter has created an inclusive audio space, opening the door to conversations about our clothing and the layers of stories, meaning and potential impact connected to what we wear. Mike Farid – founder of Nature USA - A fair trade apparel manufacturer that been committed to manufacturing apparel with a reduced impact on the environment. Located in SoCal, they use eco-friendly fibers, less water, less energy and local manufacturing for an overall smaller carbon footprint. Jeff Denby – Co-Founder of The Renewal Workshop & Pact Apparel. The Renewal Workshop is a company offering industry-wide solution to optimize the value of resources invested in apparel. Previously as the co-Founder of PACT, an award-winning organic apparel basics brand, Denby built a brand that differentiated itself from other apparel brands by manufacturing it’s garments in transparent supply chains. Hoda Katebi is a Muslim-Iranian abolitionist, photographer, author, community organizer and political fashion blogger at JooJoo Azad. With MelaninASS being a platform that is focused on intersectionality within the sustainable fashion community, we particularly applaud KODA for taking the road less traveled and creating a narrative focused around race politics and digging deeper into socio-political barriers for women of color. Obviously, while at a fair trade event, we heard the traditional answers as to what Fair Trade means. It’s about creating economic opportunity, transparency, providing fair wages and instilling proper regulations to ensure the safety of workers. A common theme through the fair trade conversation was the importance of conscious consumerism - being cognizant of where we spend our money and how. Understanding that everything is connected and our choices here in America affect the world at large. Overall, the panel did an excellent job of bringing diverse viewpoints to the conversation of sustainability. Ethical fashion most certainly is a global concept but as the moderator, Kestrel Jenkins mentions, "We have to act LOCALLY". In LA, the garment industry employs 45,000 people and it’s the capital for production but also the capital sweatshops in the US. There's work to be done right in your own backyard. 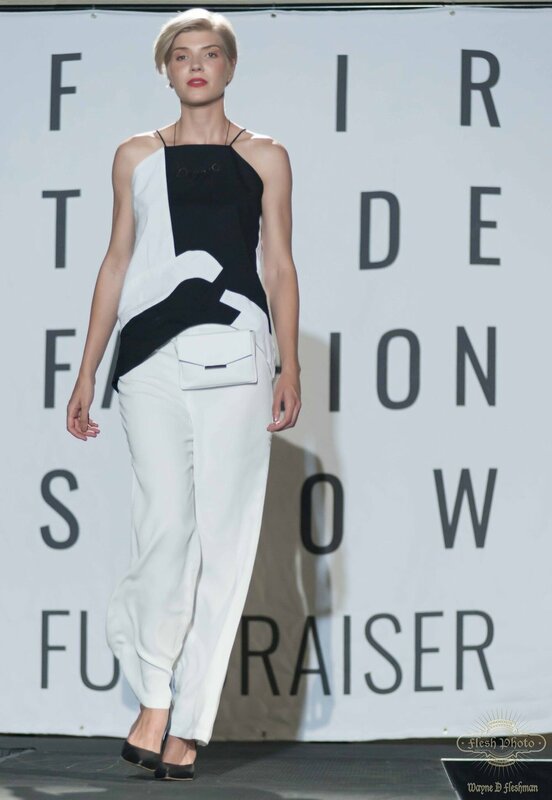 The fashion show of global designers was curated by Sica Schmitz, founder of Bead & Reel which is an award winning luxury boutique focused activist fashion. Sica believes that style and ethics aren't muturally exclusive which is why her platform offers eco-friendly, cruelty-free, sweatshop-free styles for the conscientious woman. We were elated to have such an amazing swag and would like to thank all of the in-kind donation sponsors! A special thank you to Twinkle Apothecary, FAIR Drinks, Bare Snacks, Gaffer & Child, Lucy & Jo, The Tote Project, LA Relaxed, GlobeIn, Hands Producing Hope, Wunderkid, Maggie's Organics, Victoria Road, My Sister, Raven & Lily, T.S. Fux, Bead & Real.